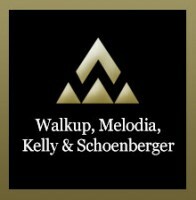 Established in 1959, Walkup, Melodia, Kelly & Schoenberger is one of the premier personal injury firms in the United States. For more than five decades, our personal injury attorneys have successfully represented injured people in both state and federal courts, before arbitration hearing boards and in mediation and settlement conferences. In the process, we have helped establish new law and used personal injury litigation to compel corporations to produce safer products. As leaders in the areas of personal injury and wrongful death litigation, our attorneys have helped shape personal injury law, while securing millions of dollars in financial compensation for injured clients.